Éva's birth was symbolic: it took place a day before the Hungarian Uprising of 1956. Her parents were László and Ilona Takács. Éva was studying first at Ságvári Endre School, then at Steinmetz Miklós Hymnasium, graduating in 1972. Even as a child she had outstanding ear for music and vocal skills; in primary school she learned to play piano, then came violin. She frequently took part in amateur talent activities and sang in the Hungarian Radio Children's choir for a year. In the late 1960s Éva's classmate Eminek Gulyás introduced her to the members of the band named "Stereo" who were looking for a female singer. "Stereo" had five members: János Hechtl (keyboards and vocals), György Juhász (guitars), János Csiga (bass), Gyula Balogh (guitars) and István Tóth (drums), who was a drummer in the original "Neoton" during 1965-1968. János Hechtl, the band's leader, invited Éva to sing with them at a night-club. Eventually Éva began to perform together with "Stereo" at different clubs, bars, parks and community centers of Budapest ("Rózsá", "Dunai", "Budai", "Hilton", Csepeli Park, Lörinci Park) and other cities, turning into an indispensable member of the band. Their definite hit songs were psychedelic "Keresd az utat" and "Napsugár". Thus Éva began her singing career as early as highschool. To improve her skill Éva started taking singing lessons with a veteran teacher Ödön Hoffmann in 1970. Under his guidance she was performing famous songs of such time-honoured Hungarian artists as Anna Zentai, János Koós, "Express Együttes", Pál Szécsi, Kálmán Latabár and many others. 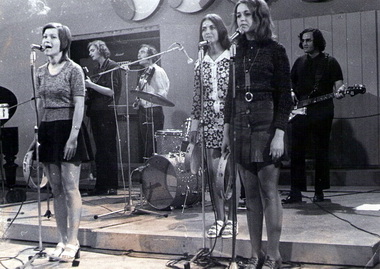 In 1972 Ödön Hoffmann decided to found a vocal trio named "Kócbabák" ("Shaggy Dolls"), with two of his other students, Marcella Babics and Éva Fábián, alongside 16-year old Éva . Backed by "Stereo", their trio entered a popular "Ki mit tud?" talent show, making it only to the semifinals. Curiously, Éva's final math exam was scheduled to take place the day after the show. Éva eventually became subject to obligations to two musical collectives at once; moreover, "Stereo" guys who deemed Éva one of their own were jealous of her attentions to the trio, while "Kócbabák" girls were secretly jealous of Éva "owning" an all-male band. After a mediocre performance on "Ki Mit Tud?" the future of "Kócbabák" was uncertain. Marcella Babics left the trio, joining "Apostol" band. Éva Fábián, who set her hopes on the trio, started looking for someone to replace Marcella, and in Autumn Éva Pál became a new member of "Kócbabák". Éva Csepregi graduated school and got a secretary job in Chinoin company engineering department with a help of her classmate Judith Écsy's father. She still occasionally joined "Stereo" on stage. 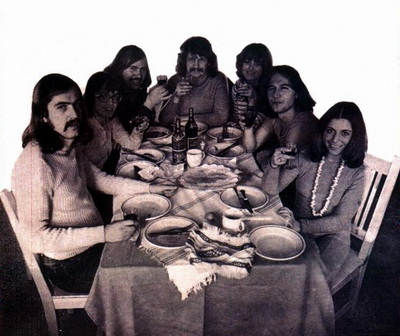 Nevertheless, in early 1973 "Kócbabák" was contacted by Hungarian TV, which was making a music show for Sweden to introduce recent Hungarian pop to Swedes. Éva Csepregi had to be a lead singer for the whole show. Due to the constant rehearsals she had to leave her job; it was then she decided to dedicate her life to singing. 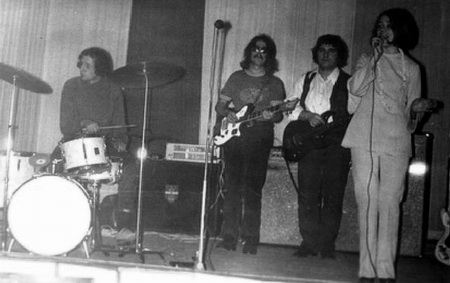 Later, in Summer 1973, the trio was performing at a bar called "Poppy" (Pipacs Bár) on Balaton; László Pásztor of "Neoton" band approached them and proposed to record a song for "Tessék választani!" radio talent show together. "Stereo", having lost their singer, switched to working with the other artists; and thus began "Kócbabák" and "Neoton"'s collaboration. In 1976 the band drew attention of a bureaucrat named Péter Erdős who began supervising them; soon the band was reformed under the name "Neoton Família". In 1979 the band got a Grand Prix at international MIDEM event in Cannes with a song titled "Santa Maria", gaining wordwide renown. Some time later Éva agreed to become Péter Erdős's partner; their relationship lasted for several years. 30 years later, in 2009, she'll write a book titled "Napraforgó", detailing her relationship with Peter and the important role he played in her life. 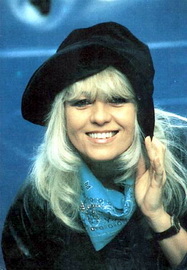 Eva went to become "Neoton Família"'s lead singer; her voice could be heard in such songs as "A Várunk rád" (1976), "Egy vidám dal" (1976), "Over the rainbow" (1978), "Szédult napraforgó" (1979), "Smile again" (1980), "Nézz rá!" (1980), "Vadvirág" (1981), "Game of chance" (1981), "Monte Carlo" (1982), "Nem szállunk ki a hajóból" (1982), "Atra" (1982), "Hosszú az a nap" (1982, cover version of a classic Hungarian hit song originally sung by Erzsi Kovács in 1958) and so on. In 1983 a duo of Éva Csepregi and "Neoton Família" guitar player Ádám Végvári got a Grand Prix at YAMAHA festival in Tokio with a song titled "Time goes by". In 1984 Éva Csepregi got married to Scottish musician Bob Heatlie, producer for West German label Hansa who worked with such famous British artists as Cliff Richard, "Shaking Stevens" and "The Monkees". They got acquainted while composing a hit song "Japanese Boy" for popular Japanese singer Aneka. The same year Éva started her solo career, still participating in "Neoton". In the 1980s she released albums titled "Midnight" (1985), "Kék korszak" ("The Blue Age", 1987), "A sárkány éve" ("Year of the Snake", 1988), "Így vagy úgy" ("Someway or Other", 1989). "Kék korszak" solo album got Éva a prestigious eMeRTon'87 award issued by Hungarian Radio. 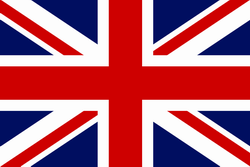 Her singles were published in many European countries including Italy, Germany and Netherlands. Among her most popular songs are "Midnight" (1985), "Dance with me" (1986), "Párizsi Lány" (1987), "OK Gorbacsov" (1988), "Európai Rock" (1988), "Runaway" (1989), "Clap Your Hands For Gorbachev" (1989) and many others. On top of this she recorded two duo albums with Ádám Végvári in 1985 and 1987, hosted aerobics (which was wildly popular then) and music shows on Budapest TV. Éva became largely famous in Asia where she was known as Eva Sun. A number of her albums and compilations combining her most outstanding solo songs and "Neoton Família" songs popular in Asia sung in English and Korean was released in Korea. In 1986 Éva also got a Most Outstanding Performance Award at 8th Seoul Music Festival for a song titled "Love is magic" performed with "Neoton Família". Two years later Éva Csepregi performed a ceremonial song titled "Korea" together with a former singer of an East German disco band "Dschinghis Khan" Leslie Mandoki at Seoul Olympics Opening Ceremony. During the 1980s tension between "Neoton Família" members grew, and in the late 1989 the band broke up. Shortly before that Éva wrote and published a book detailing her life and music career titled "Éva vagyok a Neoton Famíliából" ("I'm Eva from Neoton Family", 1988), pointing out that she hates alcohol and dislikes punks among other things. After the band's breakup Éva became a managing director of a new Neoton-Pro record company in 1990, assembling a band named "Éva-Neoton" which included some of the former "family" members (Ádám Végvári, János Baracs, Edina Schäffer) and a new singer Renáta Rajcs. During 1990-1992 "Éva-Neoton" released several LPs and two compilations of Hungarian cover versions, first of "ABBA" songs (1992), second of "Boney'M" songs (1993). In 1992 David, Éva Csepregi and Bob Heatlie's son, was born, so Éva left the world of music for a while to care for him. After David gor older, she returned to her solo career, becoming also an actress of Éva Ruttkai Theater during 1996-1999. Her husband broke up with her though, so she had to raise her child alone. In 1996 György Jakab, one of the head composers and musicians of "Neoton Família", died, and all former members of the band decided to join forces once again. Éva took part alongside them in a 24 August 1998 concert commemorating the life of György Jakab and performed at Diáksziget festivals ("The students island") of 1998 and 1999. In 2002 Éva, celebrating a 30th anniversary of her singing career, released an album titled "Jubileum", a collection of her favorite "Neoton Família" hits in English with up-to-date arrangements. This album got a warm reception by her fans.